Objective: To analyze potential activation of oxidative stress tolerance systems by SAB E-41 bacterial extract in promoting the life span of yeast Schizosaccharomyces pombe. Methods: In vitro analysis was done to assess antioxidant activity of SAB E-41 bacterial extract. Antiaging property of the particular extract was then assayed through spot test and chronological life span assays. Furthermore, sty1 mitogen-activated protein kinase, pap1 transcriptional factor of oxidative stress response and its downstream genes, ctt1 were evaluated via real time PCR. The protein level of ctt1 was then observed via Western Blot analysis. In addition, accumulation of reactive oxygen species and mitochondrial activity were conducted to understand the effect of SAB E-41 upon oxidative stress response systems in vivo. Results: The IC50 values of corresponding extract for antioxidant (DPPH; ABTS) and antiglycation were 402.40, 358.13 and 683.55 μg/mL, respectively. In addition, SAB E-41 extract (750 μg/mL) exhibited antiaging properties, which could be attributed to significant up-regulation of oxidative stress response genes, sty1, pap1 and ctt1. Interestingly, SAB E-41 extract could enhance stress tolerance phenotype of Schizosaccharomyces pombe against H2O2-induced oxidative stress. These results were supported by increasing mitochondrial activity and reactive oxygen species intracellular levels. Conclusions: SAB E-41 extract could promote yeast life span likely via up-regulation of oxidative stress responses in yeast. Our results suggest that adaptive response via up-regulation of oxidative stress transcriptional factors, and its downstream gene, ctt1, as well as mitochondrial activity contributes in combating oxidative stress thus promoting yeast life span. Foundation project: This research was supported by Master program of Education Leading to Doctoral Degree for Excellent Graduate program 2017 from the Ministry of Research, Technology, and Higher Education of the Republic of Indonesia (No.136/SP2H/LT/DRPM/IV/2017). Aging is a highly complex biological phenomenon that occurs in all living organisms. Oxidative stress, caused by the excess amount of reactive oxygen species (ROS), and accumulation of advanced glycation end products (AGEs) are called as the main factors caused aging,. Both of molecules may damage DNA, lipids, and also have been implicated in numerous diseases, thus proposed as a molecular cause of aging,. ROS, including hydrogen peroxide (H2O2), superoxide anions (O-) and hydroxyl radicals (OH-), are generated by the chemical reduction of oxygen by a variety of cellular enzymes or by incomplete reduction of oxygen to water in the mitochondrial respiratory chain. However on the mild level, ROS are employed some signalling pathways involved in stress response, proliferation and inducing the adaptive response mechanisms. On the other hand, AGEs are cellular molecules that are formed by glycation process through maillard reaction between proteins and reducing sugars. These processes result in formation of Amadori products leading to the formation of the toxic AGEs molecules. In line with that, it can be suggested that anti-ROS and anti-AGEs effects of compounds that are implicated with antioxidant and antiglycation activities are possible to be used as one of the actions to counteract aging in vitro. In this study, we used SAB E-41 bacteria isolated from marine sponge Jaspis sp. taken from Waigeo Island, Raja ampat, Indonesia. Crude extract of this bacteria was reported to have antibacterial activity. In addition, this isolate exhibited Ketide Synthase and Adenylation domain of encoding bioactive compound genes and was identified as Bacillus sp. based on 16S rRNA. Interestingly, corresponding extract showed antioxidant and anticancer activities against human cervix HeLa cells. In the present study, the potential antiaging properties of the particular SAB E-41 extract are studied. In doing so, we have investigated the potential antiaging properties of corresponding extract by using yeast Schizosaccharomyces pombe (S. pombe) as model organism correlated with H2O2 induced oxidative stress. The fission yeast S. pombe is a popular model organism to study aging as well as oxidative stress response mechanisms,. The conserved mRNA splicing process with metazoan indicates mitochondrial inheritance mechanism similar to mammalian cells. In addition, S. pombe has the sty1 mitogen-activated protein kinases pathway that contributed to the response of yeast cells against oxidative stress. The sty1 pathway activates both transcriptional factors pap1 and atf1, thus controlling the expression of some downstream antioxidative genes including ctt1, gpx and tpx. Mammalian homologs of these factors, Atf2 and cJun, are regulated by the JNK and p38 stress activated protein kinases. However, oxidative stress response is essential for yeast survival since this process will activate yeast defense mechanisms to combat oxidizing agent. Briefly, about 1% of liquid bacterial cultures were re-inoculated on Sea Water Complete liquid medium and incubated for 3 d with shaking on 120 rpm at room temperature. Subsequently, bacterial cultures were mixed with ethyl acetate (1:1) and shaked as modification technique was performed at room temperature for 20 min. The ethyl acetate layer was separated and evaporated by using heating temperature of 60 °C to collect bacterial crude extract. In addition, phytochemical screening was conducted to assess the corresponding compound groups of crude extract. Briefly, 2,2-diphenyl-l-picryl-hydrazil (DPPH) solution (125 μM) was mixed with extract or standard (ascorbic acid) in 96-well plate. The mix was incubated on the dark at room temperature for 30 min and the optical density was measured at 515 nm. In addition, ABTS solution (7 mM) was oxidized by potassium peroxide sulfate for 12-16 h. Furthermore, about ABTS radical was reacted with extract or standard (ascorbic acid) and incubated for 30 min at 96-well plate. The absorbance was measured at 734 nm. Inhibitory concentration of 50% (IC50) scavenging of radicals was determined. For antiglycation assay, solution consisted of bovine serum albumin (20 mg/mL), glucose (235 mM), fructose (235 mM) and extract or positive control (Aminoguanidine) in phosphate buffer 0.2 M (pH 7.4). Solutions were incubated at 60 °C for 40 h, then the excitation fluorescence intensity was measured at 330 nm and the emission at 440 nm. Inhibitory concentration of 50% (IC50) against the AGEs molecule was measured. Yeast strain used in this study was wild type of S. pombe ARC039 (h-leu1-32 ura4-294). Genetic manipulation including epitope tagging on ctt1 with green fluorescent protein (GFP) was performed by using chromosomal integration of PCR amplified cassettes of the targeted DNA-flanking regions. pFA6a-GFPkanMX6 plasmid was used as a template to generate carboxyl-terminal GFP-tagged proteins cassettes. Subsequently, yeast transformation procedure was then performed to integrate the corresponding PCR cassettes into yeast cells. For selective growth of the transformants, G418 (Santa Cruz Biotech) antibiotics were added to Yeast Extract with Supplement (YES) plates medium at concentration of 100 mg/mL. Spot test was performed as the study described earlier with some modifications. The inoculum was re-inoculated on 3 mL YES treatment culture (on 20 mL test tube) with an initial OD600 of 0.05. Extract diluted on DMSO was supplemented in treatment culture. Yeast cells on Edinburgh Minimal Medium (EMM) and YES liquid medium supplemented with DMSO were designed as positive and negative controls, respectively. Each culture was incubated with shaking at 300 rpm for 11 d at 30 °C and spot test was conducted on day 1, 5, 9 and 11. For oxidative stress tolerance assay, yeast cells were grown, diluted and spotted (as described above) on YES plates containing the various concentrations of H2O2. Briefly, inoculum was re-inoculated into 50 mL (on 250 mL flask) of YES liquid medium with an initial OD600 of 0.05 as a treatment culture then added with extract. 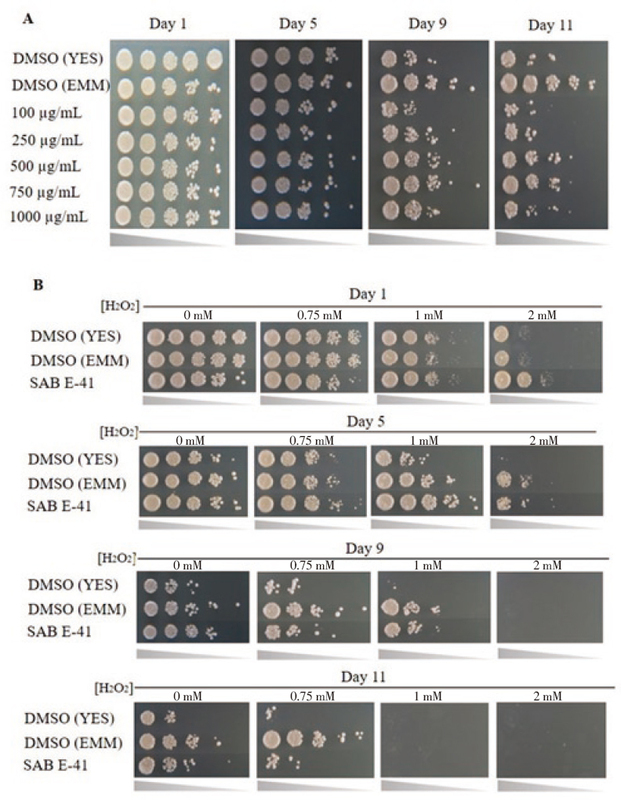 Yeast cells on YES liquid medium and EMM liquid medium supplemented with DMSO were set as negative and positive controls, respectively. All cultures were grown till day 20 with shaking (120 rpm) at 30 °C . Maximum cell density was achieved approximately after 24 hours of growth in YES liquid medium. One day after inoculation was used as day 1 of chronological life span. Furthermore, cellular viability was conducted at day 1, 4, 7, 10, 13, 17 and 20 by using Total Plate Count method. Yeast cells were cultured in 3 mL YES liquid medium (on 20 mL reaction tube) with an initial OD600 of 0.05 after the administration with extract. Furthermore, treatment was incubated with shaking on 300 rpm at 30 °C for 24 h before cell harvested. In addition, 1 mM H2O2 treatment was conducted 1 h prior to cell harvested. RNA was extracted by using Rneasy Mini Kit (Qiagen). cDNA synthesis was conducted via reverse transcription reaction with random primer (Applied Biosystems) with RNA concentration of 2 μg. The sty1, pap1, ctt1 and control act1 were determined by using Light Cycler 96 Systems Roche and using SYBR green PCR Master mixed (Applied Biosystems) as a fluorescent reporter. Subsquently, the amounts of sty1, pap1 and ctt1 mRNA level were normalized to that of act1. Wild type of yeast cells was cultured on designated treatment conditions as mentioned above. Soluble protein extracts and catalase activity were determined by using previous method. Briefly, soluble extract was added to 20 mM H2O2 in 50 mM phosphate buffer (pH 7.0). H2O2 decomposition was monitored at 240 nm (Beckman Coulter DU 800) (ε240 = 43.6 M/cm). One unit of catalase activity was described as the capacity of corresponding enzyme to catalyze the degradation of 1 mmol of H2O2 per-min. To collect whole cell extract, yeast cells treatment was designed for the qRT-PCR analysis (see above). Trichloroacetic acid extracts were prepared as described earlier. Sodium dodecyl sulfate-polyacrylamide gel electrophoresis was performed by subjecting 5 μg of total protein to 7.5% of polyacrylamide gel. Subsequently, proteins were transferred to polyvinylidene difluoride membranes (Immobilon, Millipore) and probed with a mouse monoclonal anti-GFP antibody (12CA5, Roche Life Science) followed by a mouse IgG secondary antibody. Western blot signals were detected by using a chemiluminescence-based approach using Image Quant LAS 4000 (GE Healthcare Life Sciences). Mitochondrial activity was monitored via a fluorescent dye Rhodamine 123 (Sigma Aldrich). Yeast cells were cultured in 3 mL YES liquid medium (on 20 mL reaction tube) with an initial OD600 of 0.05 after the administration with SAB E-41 extract. Cells were harvested after grow till log phase and further suspended in 50 mM sodium citrate buffer (pH 5.0) containing 2% glucose. Rhodamine 123 was added at a final concentration of 50 mM to the cell suspensions and stained cells were observed via fluorescent microscope Axiovert 200M (Carl Zeiss, Germany). Cellular ROS measurement was determined by using flow cytometry as described by previous study. Briefly, yeast cells were grown on designated conditions as mentioned in mitochondrial activity (see above). Yeast cells were suspended in 50 mM potassium phosphate buffer (pH 7.4) containing 10 mM of 2’,7’-dichlorofluorescein diacetate (Ana Spec Inc). Positive control was conducted by using 1 mM H2O2 treatment to the culture 2 h prior to being harvested. The fluorescence intensity was quantified by using the BD Accuri C6 instrument (BD Biosciences, USA) with the FL1-H channels. Statistical analysis was performed as mean ± SD from three independent replicates. One ways analysis of variance (ANOVA) was applied for comparison of the mean values with 95% and 99% confidence levels. Further analysis was performed by multiple Duncan test range test. Differences were significant as P<0.05 or P<0.01. Based on phytochemical analysis, ethyl acetate-derived SAB E-41 extract contained some groups of bioactive compounds including alkaloid, flavonoid, steroid and terpenoid. Furthermore, for in vitro antioxidant and antiglycation assays, IC50 value indicated the ability of sample to stabilize 50% reactivity of the designated free radicals or to inhibit 50% production of AGEs molecules. Thus, low value of IC50 exhibited strong activity assays compared with positive controls. Antioxidant activity was assayed by using 2 different radicals including DPPH and ABTS and the obtained IC50 values were 402.40 and 358.13 μg/mL, respectively. The result for antiglycation showed that SAB E-41 extract had IC50 of 683.55 μg/mL [Table 1]. The IC50 values of antioxidant and antiglycation activities indicate that SAB E-41 extract had low in vitro activity compared with positive control. However, the IC50 of corresponding extract was approximately 100, 17 and 33-fold higher than its positive control for DPPH, ABTS and antiglycation activity, respectively. Table 1: Antioxidant and antiglycation activities of SAB E-41 extract. Antiaging activity of SAB E-41 extracts was performed by using spot test. We tested several concentrations of SAB E-41 extract on YES medium and found that the concentration of 750 μg/mL could significantly increase life span of S. pombe till day 11 compared with controls and other extract concentrations [Figure 1]A. We further sought to validate the effect of SAB E-41 extract (750 μg/mL) on yeast life span extension by determining their effect on the viability by measuring colony forming unit. In this case, corresponding extract caused increased longevity of yeast cells till day 20 that was comparable to that DMSO (YES) with longevity only till day 13 [Figure 2]. Thus, concentration of 750 μg/mL was employed for next analysis. 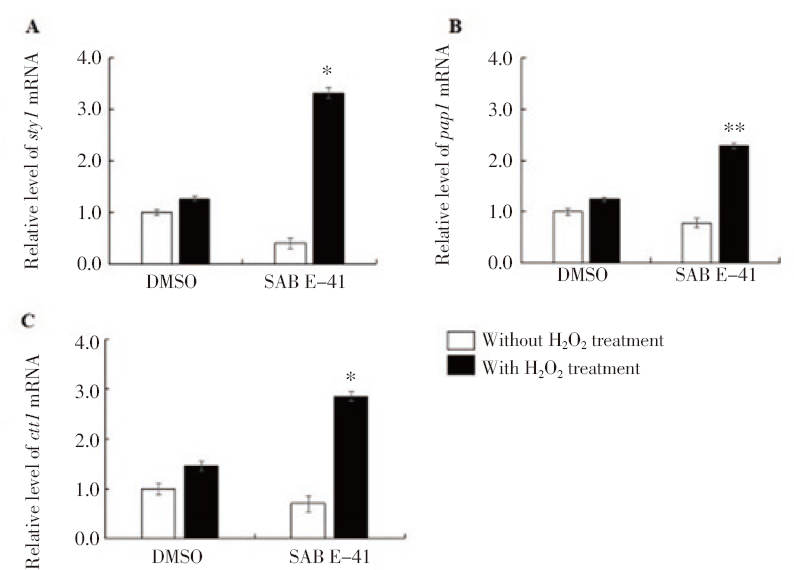 Interestingly, SAB E-41 extract treatment was exhibited to induce yeast tolerance against 0.75 mM H2O2 induced oxidative stress till day 11 [Figure 1]B. Figure 1: Chemical screening for life span-extending effect of SAB E-41 extract (different concentrations) in S. pombe. (A) Life span extension was induced by SAB E-41 extract at the best concentration of 750 μg/mL. Spot on YES plates medium. (B) SAB E-41 extract at 750 μg/mL caused yeast cells more resistant to H2O2 oxidative-stress. DMSO was used as solvent control. 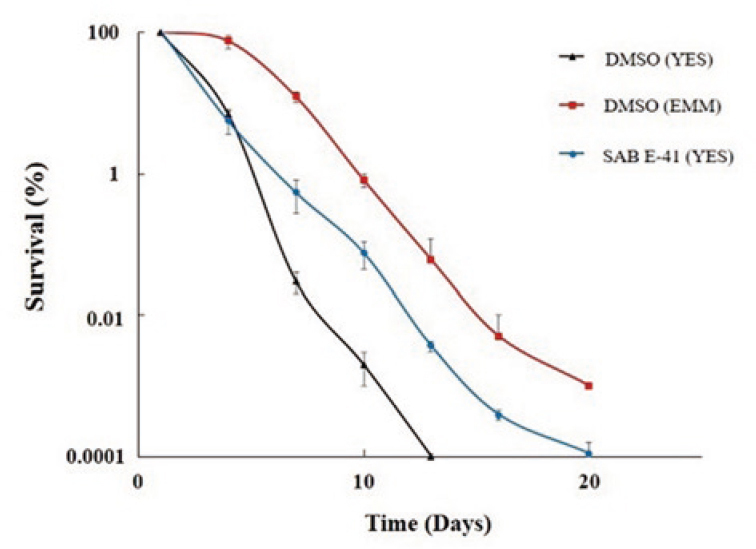 Figure 2: Life span-extending effect of SAB E-41 extract (750 μg/mL diluted on DMSO) on S. pombe cells based on standard chronological life span assay. Blue, black and red curves indicate SAB E-41 extract, DMSO on YES medium as negative control and DMSO on EMM medium as positive control, respectively. Next, we measured the mRNA expression level of some genes correlated with antioxidant defence mechanism including sty1 mitogen-activated protein kinase, transcription factor pap1 and ctt1 gene of yeast cells after being treated with SAB E-41 extract. Intriguingly, mRNA level of some targeted genes including sty1, pap1 and ctt1 was significantly increased after being treated with corresponding extract induced by H2O2 treatment [Figure 3]. Based on these results, we subsequently used H2O2 treatment in the next experiment to understand fullly the effect of this extract. Furthermore, as shown in [Figure 4], it was revealed that SAB E-41 extract increased ctt1 mRNA level and catalase activity at the best concentration of 750 μg/mL. These results were supported with other results as shown in [Figure 5] that extract treatment can increase catalase protein expression patterns based on western blot analysis, which was also supported by intracellular localization of catalase protein by detecting GFP signal. Subsequently, SAB E-41 extract treatment can induce mitochondrial activity on log phase, shown by bright fluorescent signal on yeast cells [Figure 6]A. In line with that, the results indicated corresponding extract treatment could increase ROS intracellular level as shown in [Figure 6]B. Figure 3: sty1, pap1 and ctt1 gene expressions (A, B, C) of S. pombe after administration with SAB E-41 extract (750 μg/mL diluted on DMSO). Amplification of act1 was used to normalize the relative levels of corresponding mRNA. One mM H2O2 was supplemented on yeast culture 1 h before cell harvested. *P<0.05, **P<0.01. Figure 4: ctt1 gene expression (A) and changes in catalase activity (B) of S. pombe after treatment with different concentrations of SAB E-41 extract (“0” indicates yeast cells supplemented with DMSO). Catalase activity was assayed by using wild type of S. pombe. One mM H2O2 was supplemented on yeast culture 1 h before cell harvested. *P<0.05, **P<0.01. Figure 5: Catalase protein expression patterns after administration with various concentrations of SAB E-41 extract (diluted on DMSO) (A) and intracellular localization of catalase (B). Bars represent 5 μm. “0” indicates yeast cells supplemented with DMSO. Figure 6: Mitochondrial activity after treatment with extract (A) and intracellular ROS level after treatment with extract (750 μg/mL) (B). Bars represent 5 μm. Black, red, blue and yellow curves indicate DMSO, DMSO + H2O2, extract treatment and extract treatment + H2O2, respectively. The initial in vitro phytochemical analysis showed that SAB E-41 extract contained a group of alkaloids, flavonoid, steroid and terpenoid. This result was consistent with previous study that this extract contained some groups of compounds as mentioned above. Generally, phenolic and flavonoid compounds were reported to possess high antioxidant, antiglycation and correlate with antiaging activity. We furthermore report here that corresponding extract has low antioxidant and antiglycation activities compared with positive controls. In addition, previous study reported DPPH scavenging activity of compounds which were isolated from Bacillus sp. associated with sponge collected from Agatti Island, Maldives with IC50 value of 15.02 μg/mL. On the other hand, only few study reported antiglycation activity of sponge-associated bacterial extract, which comes from plant extracts such as root crude extract from Mangifera indica with IC50 of 147 μg/mL. Thus, SAB E-41 extract has the antioxidant activity with IC50 value of 23 until 26-fold higher than antioxidant activity of compounds isolated from Bacillus sp.. In addition, corresponding extract showed the antiglycation activity with IC50 value of 4.6-fold higher than the same activity of root crude extract from Mangifera indica. Based on these results, it can be known that SAB E-41 extract has low in vitro activities compared with previous research. Surprisingly, our results showed that SAB E-41 extract can significantly increase yeast cells viability when cultured on the YES liquid medium. These suggest that SAB E-41 extract has potentially antiaging in vivo even low in vitro activity. In fact, life span extension effect of corresponding extract was shorter than that yeast viability on EMM medium. Notably, fission yeast was reported to have calorie restriction (CR) response while growing on low glucose medium such EMM. It was reported that CR can induce respiration of yeast cells rather than glucose fermentation since log phase affects high yeast mitochondrial activity, resulting in mild level of intracellular ROS and triggering adaptive response mechanism against oxidative stress. CR also can inhibit nutrient signalling kinase such Pka1, Sck2 and Git3, which affects cells longevity,. In contrast, on high glucose medium such as YES, yeast cells showed the contradictory mechanism compare with CR condition. It was shown by the acceleration of aging process from yeast cells when cultured on YES medium. Thus, our results suggested that SAB E-41 extract may exhibit mimetics CR condition, in which this extract can increase yeast life span even on non CR condition. Next, our results showed that extract treatment can increase expression level of sty1 pathway, pap1 transcriptional factor and ctt1 gene compared to the untreated groups. Consistent with this, catalase activity and catalase expression patterns were also increased when treated with corresponding extract. Interestingly, SAB E-41 extract increases some targeted genes with H2O2 treatment and depending on the extract concentration. However, sty1 is a mitogen-activated protein kinase cascade that phosphorylates and regulates the stability of transcription factor atf1. The sty1-atf1 pathway is activated in response to multiple environmental stress including oxidative stress, osmotic stress, heat stress and heavy metal toxicity. On the other hand, pap1 is the transcription factor required for survival during oxidative stress by activating genes function in oxidant protection. Both of sty1-atf1 and pap1 were reported as redox sensor that is directly activated by increased H2O2 levels. Interestingly, ctt1 gene was reported as one of the genes and its promoter contains both of transcription binding sites. Thus, ctt1 could express by using distinct transcription factor depending on H2O2 level, in which pap1 will be active at low dose (0.025 - 1 mM), while sty1 will be activated at acute dose (>1 mM of H2O2),. Thus, it can be suggested that SAB E-41 extract may interfere with H2O2 treatment to activate sty1 and pap1 signalling pathway as well as increase ctt1 expression. Up-regulation of ctt1 may significantly reduce intracellular H2O2 radicals on stationary phase, causing beneficial effect on increasing yeast life span. We furthermore report here that extract treatment can induce mitochondrial activity as well as increase ROS intracellular level on log phase. One possibility is that corresponding extract likely increases the cellular ROS which leads to the modulation over some stress response genes, thus resulting in increased oxidative stress resistance and reduced cellular ROS level in stationary-phase. In line with that, previous result indicated that extract treatment could induce oxidative stress tolerance phenotype in yeast cells. Such results indicate that corresponding extract may act as pro-oxidant, as the extract could likely induce physiology mechanism of yeast cells to combat oxidative stress. Pro-oxidant mechanism was closely related with adaptive response which means that low dose of stress-inducing factors could lead to stimulatory response, whereas high doses could induce deleterious effect. Previous studies reported the pro-oxidant mechanism of 3,3-diindolylmethane and Phloxin B on S. pombe on increase of yeast longevity,. In summary, our approach of using molecular and cellular aspects for identifying biological antiaging activity has proven potential mechanisms of compound isolated from sponge-associated bacteria. We show that SAB E-41 extract has low in vitro activity, but has some beneficial effects on increasing yeast life span in vivo. We reveal pharmacological induction of ctt1 gene induced by H2O2, increasing mitochondrial activity and intracellular ROS level slows down aging process in S. pombe. Thus, we have proposed inducible as well as pro-oxidant mechanism of SAB E-41 extract to increase yeast longevity. However, further analyses are needed to determine the chemical compounds which are responsible for their promising activity. This research was supported by Master program of Education Leading to Doctoral Degree for Excellent Graduate program in year 2017 from the Ministry of Research, Technology, and Higher Education of the Republic of Indonesia (No.136/SP2H/LT/DRPM/IV/2017). Therefore, we thank for this funding to conduct this research. We also expressed thanks to Prof. Hiroshi Takagi, PhD (Graduated School of Biological Science, Nara Institute of Science and Technology, Japan) for kindly provided required facilities to carry out some parts of this research through PKPI-sandwich scholarship collaboration program between Department of Biology, Bogor Agricultural University and Laboratory of Applied Stress and Microbiology, NAIST, Japan. This research was supported by Master program of Education Leading to Doctoral Degree for Excellent Graduate program 2017 from the Ministry of Research, Technology, and Higher Education of the Republic of Indonesia (No.136/SP2H/LT/DRPM/IV/2017). Guarente LP, Partridge L, Wallace DC. Molecular biology of aging. New York, USA: Cold Spring Harbor Laboratory Press; 2008. Boulanger E, Puisieux F, Gaxatte C, Wautier JL. Aging: Role and control of glycation. Rev Med Interne 2007; 28(12): 832-840. Halliwell B, Gutteridge JMC. Free radicals in biology and medicine. UK: Oxford University Press; 2007. Poulsen WM, Hedegaard RV, Andersen JM, De Courten B, Bugel S, Nielsen J, et al. Advenced glycation end products in food and their effects on health. Food Chem Toxicol 2013; 60: 10-37. Abu bakar H. Spons (Jaspis sp. )-associated bacteria: Antimicrobial production and genetic diversity analysis. Master thesis. Bogor Agricultural University; 2009. Effendi. Antimicrobial activity of bioactive compounds isolated from marine bacteria associated with sponge Jaspis sp. and their genetic analysis. Master thesis. Bogor Agricultural University; 2012. Utami AWA, Wahyudi AT, Batubara I. Toxicity, anticancer and antioxidant of extracts from marine bacteria associated with sponge Jaspis sp. Int J Pharm Bio Sci 2014; 5(4): 917-923. Roux AE, Chartrand P, Ferbeyre G, Rokeach LA. Fission yeast and other yeasts as emergent models to unravel cellular aging in eukaryotes. J Gerontol 2010; 65(1): 1-8. Ikner A, Shiozaki K. Yeast signaling pathways in the oxidative stress response. Mutat Res 2005; 569(1-2): 13-27. Tibbles LA, Woodgett JR. The stress-activated protein kinase pathways. Cell Mol Life Sci 1999; 55(10): 1230-1254. Xiang L, Sun K, Lu J, Weng Y, Taoka A, Sakagami Y, et al. Anti-aging effects of phloridzin, an apple polyphenol, on yeast via the SOD and Sir2 genes. Biosci Biotechnol Biochem 2011; 75(5): 854-858. Batubara I, Mitsunaga T, Ohasi H. Screening antiacne potency of Indonesian medicinal plants: Antibacterial, lipase inhibition, and antioxidant activities. J Wood Sci 2009; 55(3): 230-235. Re R, Pellegrini N, Proteggente A, Pannala A, Yang M, Evans CR. Antioxidant activity applying an improved ABTS radical cation decolorization assay. Free Rad Biol Med 1999; 26(9-10): 1231-1237. Batubara I, Zahra U, Darusman KD, Maddu A. Essential oils of zingiberaceae leaves as antioxidants and antiglycation. Indones J Essent oil 2016; 1(1): 1-9. Janke C, Magiera MM, Rathfelder N, Taxis C, Reber S, Maekawa H, et al. A versatile toolbox for PCR-based tagging of yeast genes: New fluorescent proteins, more markers and promoter substitution cassettes. Yeast 2004; 21(11): 947-962. Morita T, Takegawa K. A simple and efficient procedure for transformation of Schizosaccharomyces pombe. Yeast 2004; 21(11): 613-617. Roux AE, Quissac A, Chartrand P, Ferbeyre G, Rokeach L. Regulation of chronological aging in Schizosaccharomyces pombe by the protein kinase Pkal and Sck2. Aging Cell 2006; 5(4): 345-357. Martins D, English AM. Catalase activity is stimulated by H2O2 in rich culture medium and is required for H2O2 resistance and adaptation in yeast. Redox Biol 2014; 2: 308-313. Jara M, Vivancos AP, Calvo IA, Moldon A, Sanso M, Hidalgo E. The peroxiredoxin Tpxl is essential as a H2O2 scavenger during aerobic growth in fission yeast. Mol Biol Cell 2007; 18(6): 2288-2295. Astuti RA, Watanabe D, Takagi H. Nitric oxide signalling and its role in oxidative stress response in Schizosaccharomyces pombe. Nitric Oxide 2016; 52: 29-40. Chua LS, Latiff NA, Lee SY, Lee CT, Sarmidi MR, Aziz RA. Flavonoids and phenolic acids from Labisia pumila (Kacip Fatimah). Food Chem 2011; 127(3): 1186-1192. Gopi M, Dhayanithi NB, Devi KN, Kumar TTA. Marine natural product, Pyrrolo [1,2-a]pyrazine-1,4-dione, hexahydro-(C7H10N2O2) of antioxidant properties from Bacillus species at Lakshadweep archipelago. J Coast Life Med 2014; 2(8): 632-637. Ndoye SF, Fraisse D, Akendengue B, Dioum MD, Gueyye RS, Sall C, et al. Antioxidant and antiglycation properties of two mango (Mangifera indica L.) cultivars from Senegal. Asian Pac J Trop Biomed 2018; 8(3): 137-141. Zuin A, Carmona M, Morales-Ivorra I, Gabrielli N, Vivancos AP, Ayte J, et al. Lifespan extension by calorie restriction relies on the Sty1 MAP kinase stress pathway. EMBO J 2010; 29(5): 981-991. Kudo N, Taoka H, Toda T, Yoshida M, Horinouchi S. A novel nuclear export signal sensitive to oxidative stress in the fission yeast transcription factor Pap1. J Biol Chem 1999; 274(21): 15151-15158. Nakagawa CW, Yamada K, Mutoh N. Role of Atf1, and Pap1 in the induction of the catalase gene of fission yeast Schizosaccharomyces pombe. J Biochem 2000; 127(2): 233-238. Quinn J, Findlay VJ, Dawson K, Millar JB, Jones N, Morgan BA, et al. Distinct regulatory proteins control the graded transcriptional response to increasing H2O2 levels in fission yeast Schizosaccharomyces pombe. Mol Biol Cell 2002; 13(3): 805-816. Calabrese V, Cornelius C, Dinkova-Kostova AT, Lavicoli I, Paola RD, Koverech A, et al. Cellular stress responses, hormetic phytochemicals and vitagenes in aging and longevity. Biochim Biophys Acta 2012; 1822(5): 753-783. Stephan J, Franke J, Ehrenhofer-Murray AE. Chemical genetic screen in fission yeast reveals roles for vacuolar acidification, mitochondrial fission, and cellular GMP levels in lifespan extension. Aging Cell 2013; 12(4): 574-583. Mutoh N, Kawabata M, Nakagawa CW, Kitajima S. Pro-oxidant action of phloxin B on fission yeast Schizosaccharomyces pombe. Yeast 2005; 22(2): 91-97.